Tonight's review is a cigar that traveled a long distance to get to me. 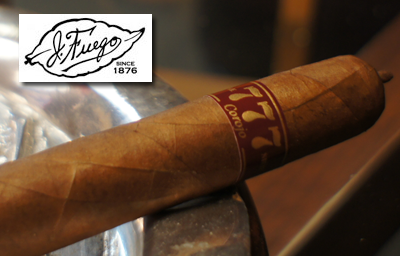 The J. Fuego 777 Corojo “Paka” is a special size of the 777 blend produced specifically for Tamura's Fine Wine and Liquors B&M in Hawaii. A quote from Tamura's Fine Wine and Liquors website: At our last smoker event with Jesus Fuego back in April, Jesus decided to create an "Exclusive" smoke for us at Tamura's. 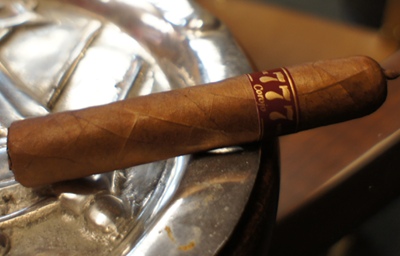 The "Paka" is based off the 777 Corojo blend, but was kicked up a little to add some more spice. It has a pig tail cap and a "closed" foot. The purpose of the closed foot is so the smoker can get a little more taste from the wrapper leaf when they first light the cigar. A limited batch was made to test it out, so if you're curious, get your stick today! A regular patron of Tamura's confirmed that there were only 200 boxes of these made. My friend Jon (Fia on the BOLT message board) sent me this stick and I want to give him a very grateful thanks because I don't think I would have managed to get my hands on one any other way. On to the review. 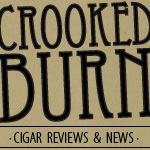 Just like the last review, I want to say this was a great size and shape cigar. The 52 ring gauge actually felt smaller and the closed foot at one end, and pigtail at the other, gave this stick a great look. The wrapper was a medium to light brown with a lot of oils. Interestingly, the cigar gave off almost no odor at the pre-light; a very slight smell of tobacco, but other than that, nothing. The pigtail clipped easily but the cold draw was nonexistent due to the closed foot. The flavor I did get from the tobacco on the head was very potpourri-ish. After torching a lot of the closed foot tobacco away, the cigar opened up nicely. I was a little nervous because this was one really "closed foot" and I thought the draw would be tough. Luckily I was proven wrong. The initial flavors I got were a lot of dry earthy tastes on the front with a sticky sweetness on the finish. Burning about an inch into the stick, I also started to get just a bit of pepper mixing with the sweet end. At this point, it was no where near the category of a spicy cigar, but there was a little pepper. The overall strength fell into the mild range. 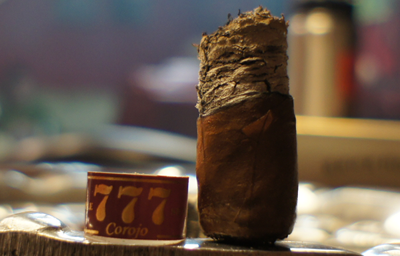 The only real change in the second third of my J. Fuego 777 Corojo “Paka”was on the front of the profile. The earthy flavors form the first third changed into more of a leather taste. For me this is a good thing because I prefer this flavor in cigars over earthy notes. The finish was still very sweet, with just a hint of pepper to knock it down. Still, at this point the cigar was in the mild strength range. If this was to be a beefed up version of the J. Fuego 777 Corojo it was not showing for me. 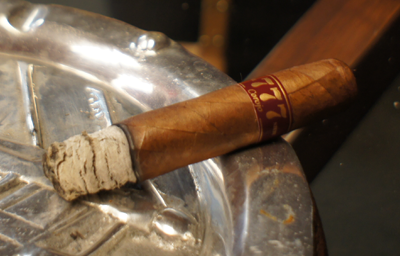 The final third of my J. Fuego 777 Corojo “Paka” had nothing new to add to the table. The flavors were the same as the second third and the strength also continued on in the mild range. I do want to point out how well this cigar was constructed. I only ashed this cigar three times and each of those was me knocking it off and not it falling off naturally. I never had to relight this stick and I never had any burning or tunneling issues. 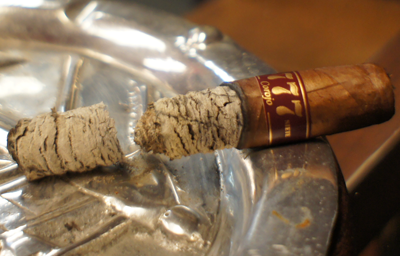 My final thoughts on The J. Fuego 777 Corojo “Paka”? This was a solid but average cigar. The flavor profile was there and the finish had a great balance, but it just didn't do much for me. It's a great cigar for people who like mild smokes or for people who are just getting into cigars because it is very easy on the body. That said, other than the cool shape, I don't really see any difference between this release and others in the J. Fuego 777 Corojo line. So seeking out this limited release would be more for the treasure hunt experience than the actual smoking experience you get from finding one, in my opinion. Would I buy it again? This is not my type of cigar, so I would not. Would I buy a box? See above.